When I first heard we were getting a Nepalese restaurant in downtown Portsmouth, I was surprised, maybe even stunned, drop-jawed. While the variety of ethnic cuisine in the area has increased quite a bit in the past 10 years, we still have a long way to go. That we have three Indian restaurants nearby and two that have been around for over two decades is wonderful, but to open a restaurant with Himalayan and Nepali food right in Tourist Central, well, that’s making a big statement, even if unintentional. I hope it’s saying that Portsmouth is ready for it. Bhola Pandey has cornered the market on Nepalese and Himalayan restaurants in New Hampshire. He’s at least part owner of Cafe Momo in Manchester and Base Camp in Hanover and now Durbar Square, named for a landmark in Kathmandu, and the Portsmouth spot is staffed by family and friends. The interior hasn’t changed dramatically since the most recent Michelle on Market Square days, but there are Nepalese art accents on the walls and the bar overlooking the square. For now, they do not have a liquor license, so BYOB or teetotal with a refreshing strawberry lassi. Nepali cuisine differs from Indian and Southeast Asian cuisine, but there are influences from the cuisines found in surrounding nations. As in most of these cuisines, there are dumplings, here called momo, found in Nepal, Indian and Tibet. You’ll find these stuffed, round packages familiar, a bit like Chinese steamed dumplings. Here, they’re stuffed with lamb, chicken, vegetables or the paneer and spinach we tried. The eight surprisingly light dumplings had bits of the mild paneer cheese and fresh spinach with a very spicy chili sauce for dipping ($9). At some point they’ll have the option to mix and match the fillings, but while they staff up, it’s one type for now. My favorite dish is also an appetizer. Choila, with chicken or sweet potato, is grilled and spiced and in the case of the chicken dish, shredded and marinated with a hint of cumin and a lot of lime ($11). There are flavors of tangy mustard oil and plenty of fresh chilies as well. They’ll ask how hot you want it, and we asked for medium, although for this dish, I could have gone hotter. It’s served with crunchy puffed rice on the side, but do mix it into the chicken for a merging of textures. Try the vegan Gundruk soup as well. Cured mustard leaf and tomatoes with plenty of heat make for a cure for any cold or hangover ($6). It hits all the healthful notes including fermentation and is often served in non-soup form as a side dish. The flat herbed bread, good for dipping into any of the sauces or soup, is dusted with herbs and spices, like a crisp focaccia ($3). The bulk of the menu comes from two categories — chilies and takari. The chili dishes are a mix of onions and peppers and other vegetables with sauteed fresh chilies and “warmer” flavors from both olive oil and sesame oil, with variations on proteins and main ingredients like duck, shrimp, lamb and buffalo; or for vegetarians and vegans, mushrooms and sweet potato. We tried the duck, with chunks of tender meat with plenty of skin on each bite, cooked to crisp ($23). On another visit, the mushroom chili had rich, marinated, large mushrooms with plenty of umami. Again, get it as hot or as mild as you like ($16). Takari is the Nepalese variation on curry with primarily a tomato base with the fresh vegetables and main-ingredient variations as well, like fish; lamb and mushroom; and plantain. We tried the shrimp, which were fresh and medium-sized, tossed in the very spicy tomato sauce ($18). I tasted cumin, coriander and cardamom. On a later visit, I tried the eggplant and basil paneer version with chunks of the white cheese soaking up the curry sauce ($16). Both the takari and chili dishes come with basmati rice topped with a bright cilantro sauce. If there are boar ribs or any boar specials on the menu (and you’re omnivorous, of course), try it if just to taste something different. Riblets of wild boar, a bit richer in flavor than pork, are tossed with chilies, onions and peppers ($25). 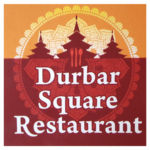 Durbar Square Restaurant brings us delightfully unique food for vegans, vegetarians and omnivores alike. Do ask questions – the absolutely charming staff wants us to know about the cuisine of their country and how they came to be in the states. They’ll help you figure out how hot you can go and explain how the dishes came to be, eager to introduce us to their ancient cuisine influenced by geographic and ethnic diversity. You’ll explore Newa cuisine from Pokhara valley and Kathmandu, and hill cuisine from the Himalayan region as well. Take the culinary trip and go back for more – and do your part to keep this unique restaurant going strong. Copyright © 2018 Durbar Square Restaurant. All rights reserved.